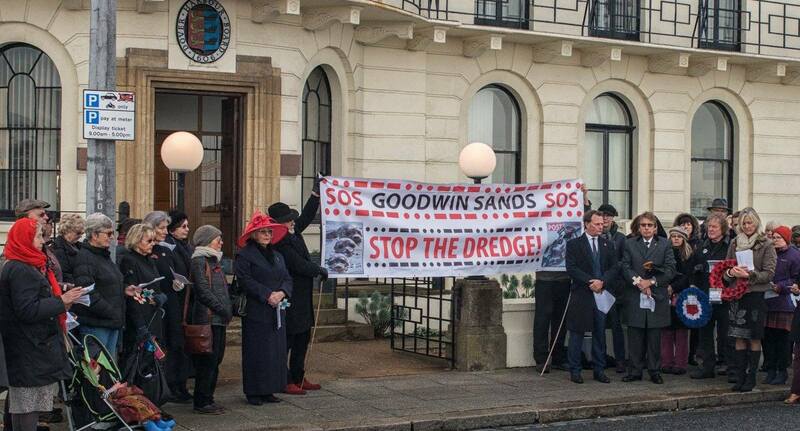 The Save Our Sands Campaign mount a peaceful protest outside the offices of Dover Harbour Board, remembering the RAF and other military personnel lost in the area of the Goodwin Sands. Campaigners have reacted with anger and a decision to seek legal advice, as the long delayed go ahead for Dover Harbour Board to dredge up to three million cubic meters of sand and gravel from the archaeologically and environmentally sensitive Goodwin Sands in the English Channel off the coast of Kent was announced by the Marine Management Organisation [MMO] on Thursday [26 July 2018]. Ironically, the controversial decision comes just a week after the conclusion of a Government consultation which would see the Goodwin Sands designated as a Marine Conservation Zone [MCZ]. However, as the MMO’s press release might suggest, Thursday’s announcement is unlikely to be the end of the story as it is already clear that opponents of the Port of Dover’s application in the heritage and natural environment communities are preparing to challenge the granting of the licence on a number of fronts. With the actual dredging programme not due to be undertaken until September 2019, campaigners opposing the dredging point out the apparent absurdity of the MMO granting a licence to dredge the site just as the Goodwin Sands as a whole have been proposed as one of 41 new Marine Conservation Zones. Marine Conservation Zones (MCZs) are the Government’s preferred mechanism for implementing their “Blue Belt” programme which is intended to protect vulnerable marine habitats and species from the pressure of human activity. While perhaps even more significant is the risk of at least one of the campaigning or conservation bodies opposing the application seeking a judicial review of the decision to grant the licence. This admission that there are no records of what was said by the parties at the meeting has led to accusations that the MMO had allowed Mr Waggott inappropriate access and opportunities for unrecorded lobbying. Another focus for criticism, and perhaps for a potential judicial review, is the fact that the Marine Management Organisation declined to publish the written scheme of archaeological investigation [WSI] as part of the most recent consultation on the dredging application, claiming that the document it held was an incomplete draft. Instead a full WSI, along with a protocol for the identification and management of archaeological finds, must be presented to the MMO as a condition of granting the final permission to carry out the dredge plan. Campaigners point out that the same accusation of incompleteness could be said of previous versions of the document which were published as part of the previous two public consultations and it follows that any statutory consultation which omitted such a key document, discussing the mitigation of one of the most contentious areas of the application, could not be said to be valid. While presenting a WSI for the archaeology of the site at a stage when the plan could not be subject to independent scrutiny and accountability is also not acceptable. It is also alleged by campaigners that the proposed dredging is not compliant with Government policy towards underwater cultural heritage as laid out in the Annex to the UNESCO Convention on the Protection of the Underwater Cultural Heritage and with the UK’s responsibilities under the 1992 Valletta Convention on the Protection of the Archaeological Heritage. However, the MMO report explaining the decision to grant the licence disputes these claims, stating that modifications to the dredge scheme to avoid seabed anomalies which have been identified currently and other elements in mitigation of the effects of the dredging are sufficient to ensure compliance. In answer to this assertion the campaigners point out that the imposition of archaeological exclusion zones around anomalies identified by the various surveys undertaken during the licensing process, and limiting the depth of dredging, does not model the impact on those anomalies of tidal action, erosion and deposition as material is removed around and above them. Without such modelling, it is argued, there is no evidence that the dredging will not swap the sudden destruction of archaeological material by the dredge head for a slower and more insidious, destruction by a pattern of tidal action and dynamic movement of the seabed which has been altered by the dredging. However, campaigners and experts who have been consulted by thePipeLine suggest that it is equally likely that, far from being able to wash its hands of the issue, the MMO may yet be forced to justify its decision in front of a judge. With that possibility comes the risk that the fragility of the environment of the Goodwin sands may be matched by the fragility of some of the evidence, or as the campaigners allege, the lack of it, upon which the Marne Management Organisation based its decision to grant the licence and the process by which the decision was made. Meanwhile, if the project does finally go ahead, with the prospect of a “No Deal” Brexit at the forefront of political debate going into the Summer, and with it the prospect of lines of HGV’s backing up for miles along the M20 as they wait to pass through Dover customs, Dover Harbour Board could always use the site as a smart new gravel surfaced lorry park, or they could lease it to the Government as a hard standing where ministers can stockpile “adequate food”.